Jennifer Stoor, a Physical Education teacher, created a culture of healthy and active living at Ponderosa Elementary School in the West Ada School District. She started a program in 2002 designed to teach kids at an early age that running, walking, and living an active lifestyle feels good. It’s called the Ponderosa Pacers! Students line up at recess to run and walk around their track – some kids run or walk 1-2 miles during recess. For each completed lap students get a marker which they then take back to the classroom where teachers use them in other daily lessons like math. This year the Pacers have already gone more than 40,000 miles! 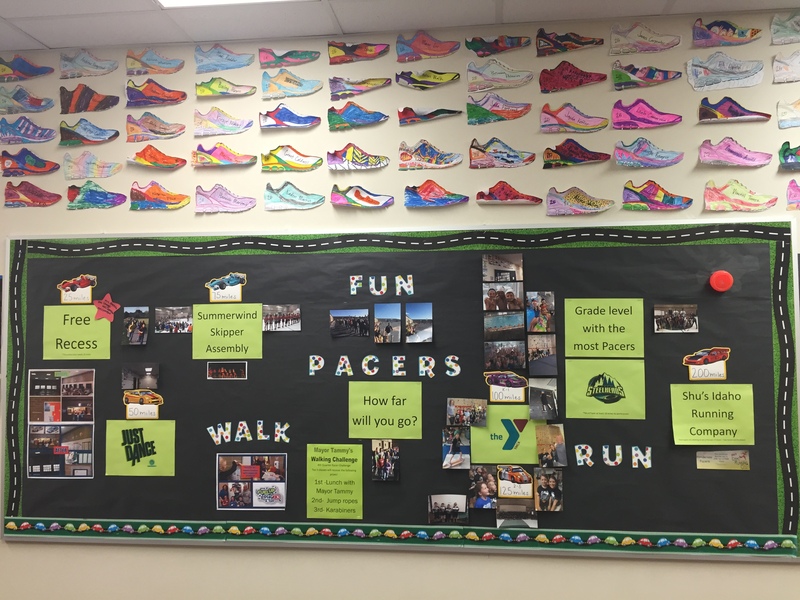 Students that participate in the Pacer program significantly improve their one-mile run time by the end of the school year. Nearly half of the students qualify as “advanced” in the President’s Fitness Challenge. Healthy and active living has spread far beyond the outside track at Ponderosa Elementary. Jennifer has helped to improve the lunch room environment as well, adorning it with posters of famous athletes and making healthy food options are easily found. When the healthy choice is the easy choice and the cool choice, everyone wins! Students have also taken their healthy lifestyle tips home to parents who are now making healthier food choices for their families and becoming more active as a family. So, parents are losing weight and reaping the benefits as well! The Pacer program is about improving the overall well- being of our youth. Students who were once overweight are now losing weight and gaining self-confidence. The kids that don’t have a lot of friends are able to join in on the cool thing to do during recess. Students are able to set goals of how many miles they want to walk and feel the pride of achieving that victory. In the end students will find that physical activity isn’t something to be dreaded but something to look forward to. At an early age they have made healthy life choices that will sustain them as they age. Do you know how to keep a healthy life? I do and I know its all about decisions. Decisions on exercise, moderation and even being organized. One important thing to be healthy is exercise. Having fun is just like exercise. One way to have fun exercising is playing out side or walking to the park. Theres also computer program called go noodle it has exercise videos and more. Another thing about how to keep a healthy life is moderation. Moderation means only a little bit of something like food. Only a little bit of ice cream, chocolate, sugar free gum, candy and sweets. One more thing about being Healthy is being organized. One way to be organized is righting down everything you eat or every time you watch TV. Take my advice if you want to live a long and strong life you should exercise, moderate your self, and be organized. Congratulations, Annabella! For your great work, you will be treated to a week at the Jordan Kent Skills Camp for you and a friend. Way to go, and keep living your healthy life! Ever consider removing the unhealthy snacks in your life, and replacing them with fruits and veggies? Well, that’s exactly what local teachers have done these past four week! 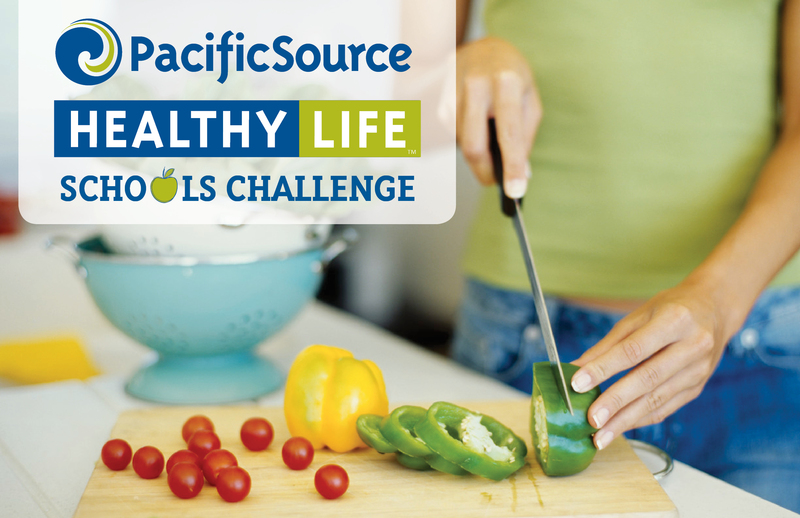 To eat healthy for themselves, as well as demonstrate their habits to our youth, the Bethel and Springfield school districts have partnered together in the PacificSource Healthy Life Schools Challenge. During the challenge, teachers have replaced unhealthy and high-calorie snacks with fresh produce, and have been very successful doing so! In four weeks, 1,449 Bethel and Springfield School teachers and staff participated in the Healthy Life Schools Challenge – that’s 74% participation! Participants consumed a healthy 24,015 fruits and veggies throughout the Healthy Schools Challenge. 6,479 unhealthy and high-calorie snacks were replaced with healthier options. Congratulations, and thank you, teachers, for being great role models!